Ford Motor Co. will recall nearly 1.5 million older F-150 pickup trucks because they could unexpectedly shift into first gear. The problem has created five crashes, including one report of a vehicle occupant sustaining a whiplash neck injury that could be linked to the defect. 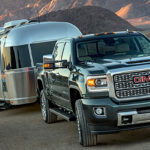 The automaker said Wednesday that all of the trucks are from the 2011-13 model years. They are equipped with a six-speed automatic transmission that can lose the electronic signal from the transmission output speed sensor to the powertrain control module. This can cause the transmission to downshift into first gear. “Depending on vehicle speed, a downshift to first gear without warning could result in a loss of vehicle control, increasing the risk of a crash,” Ford said. The recall covers about 1.26 million trucks in the United States and approximately 221,000 in Canada. The truck is the best-selling vehicle of any type in the U.S. Ford doesn’t break out sales of F-Series trucks by model, but the company sold more than 900,000 in the U.S. last year. Analysts estimate that at least two-thirds of those sales were F-150 pickups. Ford will ask owners to take their trucks to dealers, where technicians will update the powertrain control module software in the affected vehicles. Owners taking their vehicles in for the repair should note that the Ford reference number for this recall is 19S07. The automaker also issued a smaller recall for select 2019 Ford Mustang, Lincoln Nautilus and Lincoln Navigator vehicles. The instrument panel cluster won’t activate upon startup In some of these vehicles. Ford said is not aware of any reports of crashes or injuries resulting from that defect. This action affects approximately 4,200 vehicles in the United States and 150 in Canada. I have a 2015 F150 with 6 speed transmission. I have had this same problem happen. Driving in 4th. or 5th gear and transmission geared down to 1st gear. Almost caused an accident. This recall needs to be expanded to include this model year. I had the software upgrade recall done and still had problem also! $800 to replace valve body sensor. The first dealership wanted $1200. I had the recall letter for my 2013 F-150 6-speed, but it said I’d be notified when the software fix was available (supposedly will take a few months?). A few days ago my 17 year old was driving at 55mph and it shifted directly to 1st gear, locking up the rear wheels and skidding to a stop. He somehow maintained control and said he felt like he would have gone through the windshield if not wearing his seatbelt. Took it to the dealership that afternoon and they’re telling me 5th gear is cracked and that I’ll be responsible for the $3500-5000 repair – ridiculous! I think they need to look into some of the older models to we have a 2007 and I think our truck is doing the same thing. Once in a while our excelerator pedal sticks and makes the truck rev up while you are stopped. I have been looking for recalls for a while and haven’t found anything for our 2007.